Whether it be an argument with our spouse, a hard day at work, or whatever our cause of stress may be, we are all guilty of indulging ourselves in food to deal with our stress. Doing so on occasion isn’t going to affect us too much, however when we regularly turn to food as our coping tool the binge eating can really take a toll on our health. Finding the willpower in the moment to avoid binge eating can be extremely difficult if not impossible for many of us, and the key to avoiding binge eating lies within our ability to plan ahead. Here is what you need to know before your next episode, and what you can do to help you avoid binge eating. 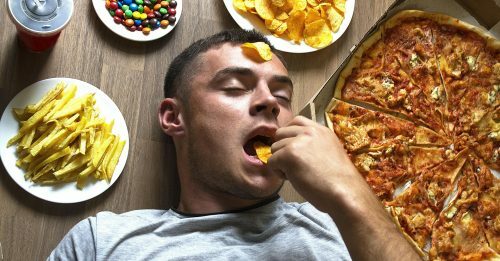 The reason why many of us resort to food as a coping mechanism to deal with stress is because the act of eating itself releases dopamine, which gives us that happy feeling. After time when we continually look to food for our dopamine release, it can be a difficult habit to break. A way to break the binge eating cycle which you may not have thought of, is to indulge yourself in other activities or hobbies which make you feel good. This doesn’t mean that you have to head to the gym, go to the bowling alley, or really put a lot of effort into doing so either – even playing video games has shown to induce pleasure. A common problem that many people who binge eat have is that they also tend to eat less meals per day than they should be, and also eat in greater portions as well. This makes us more prone to binge eating because there are greater lapses in time where we aren’t eating at all, making us that much more hungry. In turn, when we binge eat in these situations we tend to eat a greater volume of food, as there is plenty of room in our stomach to do so. A simple solution here is to eat more frequently throughout the day, but in smaller portions. This will help to keep you full consistently throughout the day, and also to fight the hunger cravings. Eating more, but smaller meals throughout the day will help to increase your metabolism as well, as well as keeping your blood sugar levels steady. This is a great way to manage your weight and drop a few pounds also. We have to remember that binge eating is mainly emotional, and to try to be cognizant of this in the moment. Before you scarf down that pint of ice cream or jar of peanut butter, try to take a step back and ask yourself why you are doing so. This may sound like a silly option as far as preventing binge eating is concerned, but being mindful of what you are doing in the moment can go a long way. 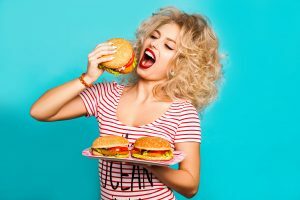 Identifying whether or not you are eating for hunger can be an effective method in preventing yourself from binge eating if you can catch yourself in the moment. You should also take notice of just how much pleasure you are getting from the act of eating itself. The pleasure centers within the brain are almost immediately activated after we being the act of eating, and this feeling of pleasure can only reach a certain level. This can be achieved within only 10-15 seconds of eating, meaning that all those calories you are consuming afterwards are doing nothing except adding on more pounds. These same pleasure centers can also be activated by eating healthy foods as well, which of course is recommended. The best way to introduce these types of foods into your diet is slowly and gradually. You should be trying new foods such as various berries which can satisfy your sugar cravings in a similar way without all the calories. While binge eating does happen sometimes outside of the home, the vast majority of the time it does happen there. If you have junk food and other food you like to binge on readily available, the chances are that you are going to do just that. The easiest way to avoid doing so is to avoid buying these types of foods in the first place. Let’s be honest, most of the time when we are craving junk food we aren’t willing to go out to travel to do so, so keeping only healthy food available is an excellent strategy here. This doesn’t mean that you can’t keep any types of snacks around, and completely depriving yourself of these foods isn’t necessary. Keep foods such as seeds, beef jerky, nuts, yogurt, trail mix and other healthy foods around that you can snack on in place of the pretzels, chips and ice cream. Relaxing is also going to help you stop binge eating, as when we are stressed we release hormones which give us the cravings for junk food. Only a very small percentage of people who are chronically stressed eat a normal diet, which makes complete sense here. Relaxing more often can mean taking a yoga class, listening to relaxing music throughout the day, or even hitting the gym or doing some other physical activity. Contrary to popular belief, exercising won’t make you hungrier and make you more prone to binge eating. Regular exercise for about 30-60 minutes a day with moderate intensity will reduce your stress, and make you less prone to binge eating. 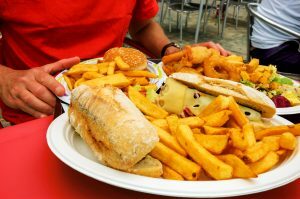 Binge eating is an extremely hard habit to break, as we do need to eat in order to survive. Naturally, this means that many people continue to struggle with this problem throughout their entire lives, and will inevitably binge eat here and there. If you do decide to binge eat on occasion, you are best to take your time in doing so. As mentioned prior, you only get a certain amount of pleasure from eating the foods you crave which doesn’t last long after your first bite. On the other hand, the sensation of feeling full from eating a meal doesn’t fully register with you until about 30 minutes after you’re full. This is a problem which can easily lead to overeating, so try to be aware of how fast you are eating, and just how much you are consuming. Eating quickly more often than not leads to overeating, so be mindful of how fast you’re going.